Cut out the shape along the solid black lines. Fold along all the dotted lines, fold A inwards en B outwards. Apply glue to A and stick to opposite side to create triangular tower. Cut out shapes along the solid black lines. Fold along all the dotted lines inwards. Apply glue to A and stick to opposite side to create a pyramid shape. Repeat until there are 3 wings. Apply glue to A and stick to opposite side to create a long triangle. Apply glue to B and stick C on top, both ends will then be closed. Cut out platform along the solid black line. On the tower, apply glue to B and place the tower on the grey triangle on the platform. On the wings, apply glue to B and place the wings on the grey triangles on the turbine. 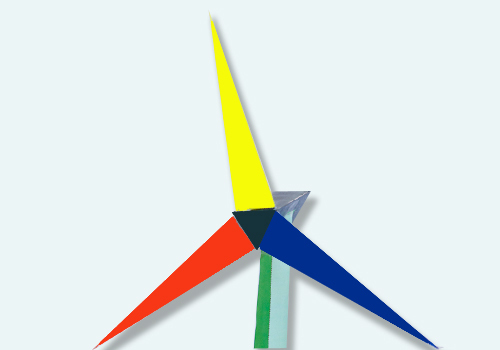 On the turbine, apply glue to the green area and insert the turbine into the tower. Source: Department of Energy South Africa and the Embassy of Denmark.